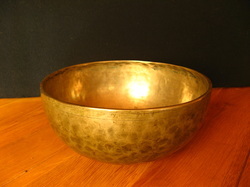 We have a selection of genuine antique bronze Tibetan Singing Bowls for sale. These are perfect for meditation and sound healing. Singing bowls are played by the friction of rubbing a wooden leather wrapped mallet around the rim of the bowl to produce overtones and a continuous 'singing' sound. There are seven bowls which are available together or separately. All bowls are supplied with a leather wrapped mallet for playing. Please use our contact form on the Shop page to make your order. Postage will be additional to the price, apply to us for rates according to your country.